After enduring chronic pain (the kind that will not let you sleep) for months, my doctor and the various specialists I was referred to finally solved my problem by prescribing a course of physiotherapy. The massages and stretches helped (and I now do them at home) but what really impressed me was the electro-stimulator. It made sense to buy my own and, after much research and consultation with my physio, I decided to invest in quality. Compex is a well respected Swiss brand and they make an impressive range of muscle stimulators covering the full spectrum of applications from occasional fitness to cutting-edge athletic support. I chose the FIT model because it seemed to be the most versatile and the price is at the bottom end of the scale (I paid £184 versus up to £1,000 for the top-of-the-line sports models). The FIT is plenty powerful enough for my needs but geared towards aesthetics and simplicity of use. It has a range of pre-set programs addressing pain relief, relaxing massage, passive muscle development (invaluable when joint pain prevents regular exercise) and even a cellulite prevention program. In fact, that was a major reason for my purchase. I noticed that, after just a few physio sessions, my thighs looked a lot smoother and more toned at the spot near the hips where the electrodes were placed. Bonus! The FIT model comes complete with four sets of electrodes (square and rectangular). 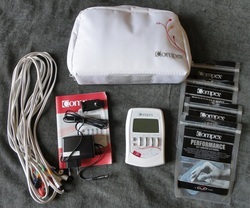 Compex say that each electrode can be used up to 30 times on clean skin. The good news is that I started using my Compex seven weeks ago and typically I run through several sessions a day (moving the electrodes to different muscle groups). I estimate that each electrode has been used over 120 times and they are still in one piece and operating correctly. I did buy extras but have not needed to use them yet. If they start to feel less sticky, I just wipe them with a damp cloth. I also like that the FIT runs on a rechargeable battery pack which easily lasts 20 hours. I am absolutely delighted with this machine and it's helping me recover from pretty intense swimming sessions that would normally cause crippling pain. I am more than impressed. 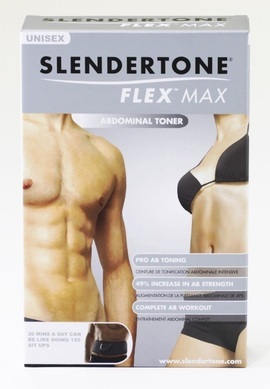 After much research and debate over different models and brands, I chose the Slendertone Unisex belt because both my husband and I were going to use it and I wanted a reliable piece of kit. My belt arrived last August, and we have been using it daily ever since. One of the main benefits is that one can choose to wear the belt while walking about and doing things, or one can increase the workout intensity by doing sit-ups in combination with the belt's impulses. I generally let it do its thing. Interestingly, both sets of batteries that came with it have run out (I have now switched to rechargeable AAA batteries), but the original three pads are still fine. Rubbing a little hand cream or anti-cellulite gel over the waist area, before using the belt, seems to keep the pads in optimal condition and they peel away from the skin easily and leaving no residue. I have bought a gel specifically formulated for use with toning pads but I haven't had to use it yet with this belt. As to results: for me, this belt works brilliantly. Having a bad back means that sit-ups are difficult to do, so I tend to skip them. In conjunction with swimming every other day and calorie cutting, the Flex Max has completely changed the way my body looks. There is still a little bit of stubborn fat over my stomach but the muscles underneath have been toned and firmed up considerably and I feel even my swimming has improved. I gave now reached the top intensity of 120 but I feel you can see benefits even at much lower settings. Looking back, I would say that there was a noticeable improvement after only a few weeks of daily use. A brilliant purchase especially at the very reasonable price of £45.